Artichokes may look inedible, but the tender heart makes a tasty option for your diet. 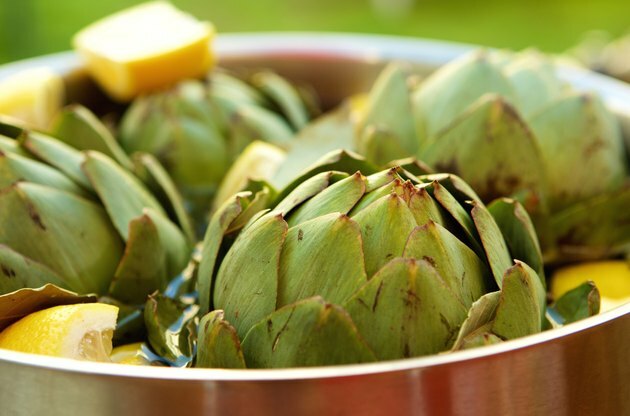 Marinating artichokes adds a rich dimension of flavor -- the marinade generally contains olive oil and other seasonings. These artichokes are suitable for adding to salads, incorporating into casseroles and eating plain. While marinated artichokes are good sources of vitamins C and A, enjoy them in moderation because they're high in sodium. A 1/2 cup serving of marinated artichokes contains 110 calories. This portion is a good option for snacking since an ideal snack contains about 100 to 200 calories. One-half cup includes 9 grams of fat deriving primarily from the oil used in the marinade, but only 1 gram is saturated, which is the unhealthy type of fat that contributes to Type 2 diabetes and cardiovascular diseases. One serving of marinated artichokes contributes 5 grams of carbohydrates, including 2 grams of dietary fiber. Marinated artichokes are a good source of vitamin C. One serving provides 35 percent of the amount you should consume each day if you follow a 2,000 calorie diet. Vitamin C, an essential nutrient, is a powerful antioxidant that is also required for an array of bodily functions, including wound healing and immune function. Vitamin C may influence your risk of some types of cancer. A study featured in the August 2011 issue of the journal "BMC Cancer" investigated the diets of over 2,300 women and found daily supplementation with vitamin C and other nutrients over a 10-year period correlated to a lower risk of breast cancer. However, more research is needed to verify this health outcome. One serving of marinated artichokes contains 20 percent of the recommended daily intake of vitamin A, based on a 2,000-calorie-a-day diet. Your eyes benefit from vitamin A because it's essential for normal night vision. It's also a vital nutrient for your immune system. It maintains the health and integrity of mucosal cells that line your airways and stop bacteria from entering your body. White blood cells that kill invading pathogens also need vitamin A to grow properly. Vitamin A is especially critical during pregnancy as it influences kidney, lung, eyes and bone development in the fetus. When you eat just 1/2 cup of marinated artichokes, you'll get 380 milligrams of sodium. The Institute of Medicine recommends consuming no more than 1,500 milligrams of sodium daily, so 1/2 cup of marinated artichokes fills one-fourth of your total daily sodium. Over-consumption of sodium may lead to high blood pressure, which increases your risk of stroke and heart disease, according to the Centers for Disease Control and Prevention. For this reason, it's important to limit the amount of marinated artichokes you eat and include the sodium they contain as part of your total daily intake. What Are the Health Benefits of Leeks?